If interested in a custom solution for your information needs, please contact us via our Help page. Therefore, users of our website can see new Filings and receive e-mailed new-Filing notifications within seconds of their appearance on the SEC website, and we can deliver to subscribers of our EDGAR Filings Feed service what we believe is a better (faster and cheaper) service than the PDS. Because we are pulling the Filings immediately, at the rate of about one second per 2-10 MBs of a Filing’s size, instead of waiting for them to be pushed to us, we have most Filings within 1-2 seconds (in the same second for small ones!) of when they become publicly viewable. Since we’re querying the SEC website for new Filings 3-7 times per second, and the PDS system isn’t supposed to transmit them to subscribers until the public (including us) can get them, then the new Congressionally-mandated Filings flow would be “broken” if the PDS system pushed a Filing to subscribers before we had it, by definition. Having dealt with SEC Filings for over 20 years, we can further guarantee that the Filings we deliver are an exact match (down to the byte) to those available on the SEC website and from the PDS system. Additionally, we can include the time stamp (down to the second) from our extensive database that each Filing became publicly viewable on the SEC website, a data item that no one else has, including the SEC (because they lose that metadata information when they replace their website servers every few years or so). • Option 2: Pull from SEC... We can have you run the same software that we wrote and run to pull the real-time new Filings from the SEC. 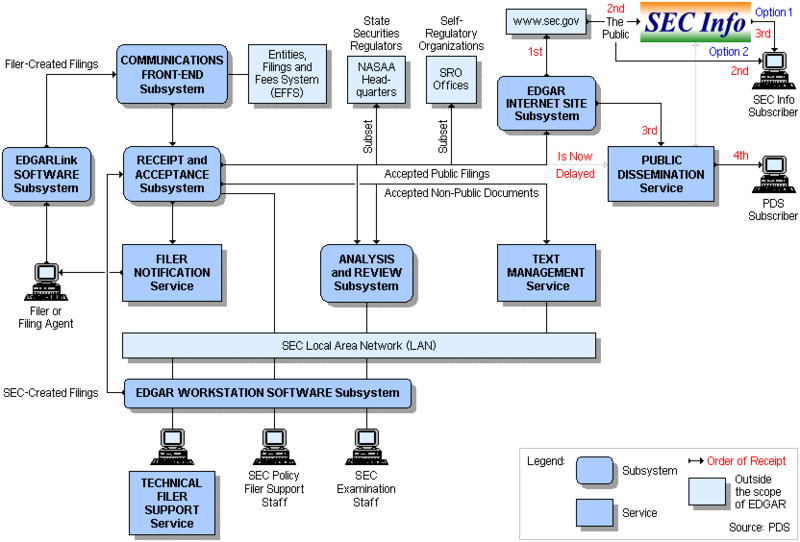 It queries the SEC website’s new-Filings subsystem that tracks the most-recent Filings filed, so it retrieves 100% of the Filings that flow through that subsystem. They represent 99±% of all Filings, since that subsystem doesn’t report the low-priority delayed-release ones (such as SEC Filing-deletion notices). Our software runs only on Windows. Having coded parts of Windows for Microsoft as Finnegan O’Malley & Company Inc. (our software development company), we’re a Windows shop, and we can tell you how to see Fran Finnegan’s (owner of SEC Info) name hidden in every version from Windows 95 through Windows 10 and Windows Server 2016. • Option 3: Options 1 & 2... You can get the best features of both Options 1 and 2, plus redundancy. For backup purposes, this is like buying both a primary feed and a secondary feed from the PDS, but we price it cheaper than buying a single feed from the PDS. With Option 3, you can use Option 1 to have us push Filings to one server (running Windows or another OS) and use Option 2 to pull Filings to a different server (running Windows). The redundancy is attained by having two sites (ours, pushing Filings to you, and yours, pulling Filings from the SEC) and optionally by you having two Filings-receiving servers. In terms of pricing, we can provide Option 1 or 2 service to you for 2/3rds the price that the PDS charges for a single feed, saving you $7,096 per year (2018 pricing). We can provide Option 3 redundant service to you for 2/3rds the price that the PDS charges for both primary and secondary feeds, saving you $9,488 per year (2018 pricing). And our Option 3 redundant-feed price is lower than the PDS’s non-redundant single-feed price! For historic SEC Filings (all since 1994, even further back than the PDS’s 1996 cut-off), we offer all the same data subsets that the PDS does, plus any other customized subset you might want, and we also sell them for 2/3rds of what the PDS charges, which would save you thousands of dollars. Ours is a true set of Filings in the same binary format that flows out of the EDGAR system to the PDS, unlike the Filings you would get if you downloaded the historic daily .zip files from the SEC website, an incredibly slow process. Remember that the SEC website gets the original Filings before they allow the PDS to release them, and that they then do their own processing of the Filings that alters them for their website before they zip them, so their zipped Filings are indeed different (e.g., no EDGAR Acceptance timestamp nor PDS Control Block) than those you would get from the PDS or us. You would have to write separate software to process the ones in the .zip files, which are binarily different than the format the PDS and we disseminate. We deliver the historic data on external USB disks. If price is not an issue and you’re thinking of using the more-expensive SEC PDS contractor, please be aware that there’s nothing proprietary (they didn’t write the PDS software) nor “official” (they’re not the SEC) about them, because they’re just a government contractor in Washington. They were simply the winning bidder in the last contracting cycle to manage the off-the-shelf software (FASTCopy) that the PDS uses, and there have been several of them since EDGAR was created (TRW, Systems and Information Technology Group, Digital Island, Keane Federal Systems, NTT DATA and Attain). The SEC allows them to directly charge subscribers for their PDS feed, at SEC-mandated prices, to get a lower bid from them to run the PDS system. They’re not selling you any SEC Filings content that is different than what we have. We are the lowest-cost provider! If interested in subscribing to our EDGAR Filings Feed service, please contact us via our Help page. Your use of this Web site [ see Our App and Other Services ] implies your acceptance of this Usage Agreement. • This Usage Agreement is between Fran Finnegan & Company (the “Company”), owner of this Web site and its underlying technology and data (“SEC Info”), and you, the user of SEC Info. You agree that all personal user information provided by you is true, i.e., the individual user name, e-mail address and phone number are real and yours. Your personal user information will not be sold to other parties by the Company or SEC Info. • You will not use SEC Info, nor will you copy features of SEC Info, in any way to develop (or manage) or while developing (or managing) a competing service, either as an employee or contractor of such competitor or any of their parents or subsidiaries. • You will not save or copy any pages of SEC Info, in their original or an altered form, for the purpose of redistributing them to another party or republishing them at a Web site or in an information service. All content of SEC Info is owned and copyrighted, and all rights to it are reserved, by the Company. • You may access SEC Info only with a Web browser. You will not access SEC Info in an automated way, such as by using computer software scripts or any other programmatic means, for the purpose of obtaining copies of our content (which we sell). The only exception to this provision is for publicly-accessible search engines. • If you write or publish anything based upon information obtained from SEC Info, you will credit SEC Info, in a way that is customary or appropriate in your profession and as you would any other information source, as “SEC Info” or “www.secinfo.com” and, if doing so electronically, with it being a Web link to SEC Info. • The Company may ask you to subscribe to SEC Info at a price rate to be determined and agreed upon at that time. To help the Company keep such potential fees low by having a large number of users, you agree that, while you use SEC Info, you will tell your friends and associates about it. The Company reserves the right to determine to whom it will provide access to SEC Info, either for free or for charge. • Neither the Company nor any providers of information to the Company shall have any liability for the accuracy of the information contained in SEC Info, or for delays or omissions therein. None of the foregoing parties shall be liable to any third-party for claims or losses of any nature, including but not limited to, lost profits, punitive or consequential damages. • This Agreement, which may be amended from time to time, is personal to you, and you may not assign your rights or obligations to anyone. This Agreement, all intellectual property issues, and your rights and obligations shall be governed by the laws of the United States of America and the State of California governing contracts wholly entered into and wholly performed within California. • You are bound by the terms and conditions of this Agreement until you have a written agreement with the Company that explicitly overrides a term or condition of this Agreement. If any provision of this Agreement is invalid or unenforceable under applicable law, the remaining provisions will continue in full force and effect.